Shop bought pastry is a little bit of a Godsend, especially for the really time-consuming pastries such as filo or puff pastry. There are some times though when shop bought pastry just wont cut it, shortcrust pastry is one of these exceptions. Not only is shortcrust pastry quick and easy to make but the difference in cost and quality is really quite noticeable. I prefer to make my pastry well in advance, often the day before, and leave it in the fridge to set. It just ends up being so much better both in terms of taste and texture. 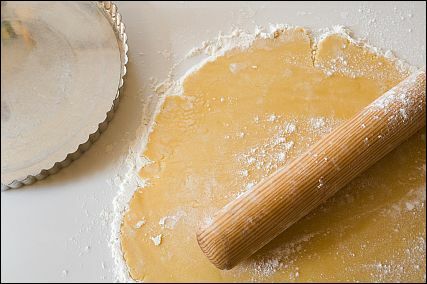 The trick to making great shortcrust pastry is to keep it cold and to try to handle it as little as possible. A marble board is great for working with pastry, you can help keep it cooler for longer and there is less chance of the dough sticking to the board. Mix the flour and salt together in a large bowl and rub the butter in with your fingertips until you have a crumb-like consistency. Slowly add in half of the beaten egg and continue to mix by hand until it comes together, you can add more egg if need be. Once the pastry has come together flatten it out into disc about an inch thick, place in a plastic bag and refrigerate for about 30 minutes.